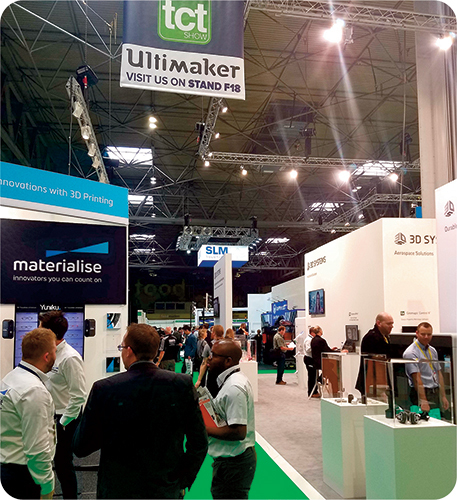 By the time the 2017 TCT Show wrapped on September 28, organizers estimated that nearly 10,000 attendees (including a team from 3D Metal Printing magazine) from more than 40 countries viewed technologies and services from more than 250 exhibitors. Though the event covers all additive-manufacturing (AM) processes, exhibits featuring 3D metal printing have continued to increase. Backing the exhibits, more than 50 presentations served to educate 1000-plus attendees on various related technologies. In a first for the TCT Show, the main stage gave visitors the opportunity to assess research developments and real-life examples of the ways 3D technologies are used throughout numerous industries via presentations by Intel, McLaren Racing, Johnson & Johnson, Sabotage Design, DuPont and others. Startup companies from the United States, United Kingdom, France, Germany and Spain unveiled their innovations in the Start Up Zone—including a pitch session where the new companies competed for the coveted 2017 Start Up Award. The winner, FabRX, looks to exploit 3D printing for fabricating pharmaceuticals and medical devices. While the company has focused on nonmetallic fused-filament printing and stereolithography to produce bioresponsive products for oral and implantable medicines, it has noted selective laser sintering, a metal-alloy-friendly process, as a possibility in producing non-metal medicinal products. This year’s TCT Show also featured the inaugural TCT Awards, taking place at Birmingham Town Hall, a short distance from the show location. The awards program recognized innovators, technology and collaborators behind the best examples of 3D-printing technology in use throughout the world. As part of the program, TCT Group launched the TCT Hall of Fame to recognize pioneers and innovators in the 3D-printing industry. Inaugural inductees, as determined by TCT’s Expert Advisory Board, include Adrian Bowyer, founder of the RepRap Project; Scott Crump, inventor of fused deposition modeling; Chuck Hull, inventor of stereolithography; Hans Langer, founder of EOS; and Fried Vancraen, founder of Materialise. In addition, the program featured 10 award categories, with a number of those related to metal AM. Sciaky, Inc. (www.sciaky.com) and Lockheed Martin earned the 2017 Aerospace Application Award for production of titanium propellant tanks using Sciaky’s electron-beam AM (EBAM) technology, which resulted in significant time and cost savings. In this application, Lockheed Martin Space Systems reduced costs by 55 percent, material waste by 75 percent and production time by 80 percent via EBAM as opposed to traditional forging methods. “This was truly a groundbreaking metal 3D-printing application for the aerospace industry that highlighted the tremendous possibilities of additive manufacturing,” says Bob Phillips, Sciaky vice president. 3D Systems (www.3dsystems.com) used the TCT Show stage to promote its printing capabilities across a variety of markets and materials. On display was an antenna bracket for a geostationary telecommunications satellite. The bracket is part of a collaboration between 3D Systems and aerospace supplier Thales Alenia Space, Toulouse, France, and highlights the growing role of AM in aerospace. For example, note 3D Systems officials, 80 percent of metallic parts for satellites are produced using 3D printing, replacing traditionally manufactured parts. Thales Alenia Space worked with 3D Systems’ Quickparts Solutions team (Quickparts is a 3D design-to-manufacturing service) to design and print the Ti6Al4V brackets, with each measuring about 190 by 230 by 290 mm. Each of the four brackets used in a satellite required an individualized design, as they mount on the antenna’s reflector edges and screw onto a shaped surface. 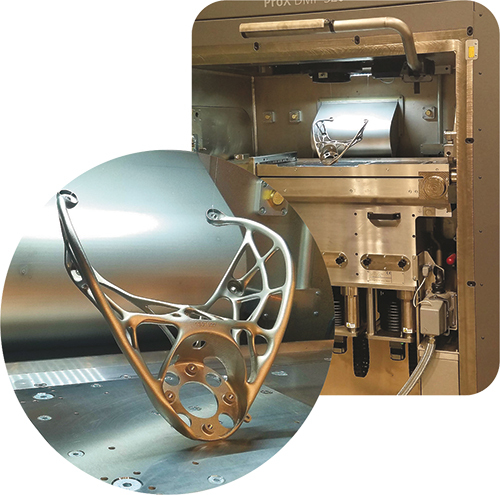 The brackets were printed on 3D Systems’ ProX DMP 320 machine, designed for heavy-duty metal parts production. It reportedly offers simplified setup and provides the versatility to produce all types of part geometries in titanium (grades 1, 5 and 23), nickel super alloy and stainless 316L. For this application, the machine produced parts in half the time required using traditional processes (from order to shipping), with weight savings of 25 percent and improved stiffness-to-weight ratios. Sciaky’s large-work-envelope EBAM machines can produce parts, via deposition, from 20 cm to 5.8 m long. EBAM boasts high-speed operation as well, with gross metal-deposition rates of 3.2 to 9.1 kg./hr. 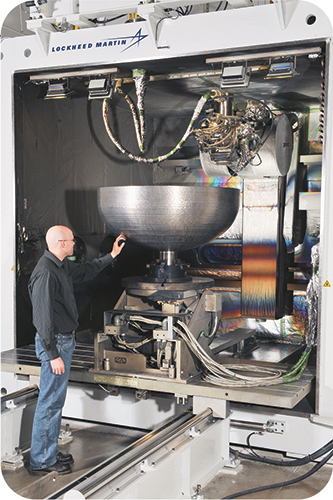 With IRISS (Interlayer Real-time Imaging and Sensing System), a real-time monitoring and control system that can precisely and repeatably sense and digitally self-adjust metal deposition, the EBAM process can deliver consistent part geometry, mechanical properties, microstructure and metal chemistry throughout a part run, according to Sciaky officials. The Automotive Product Application Award went to Volkswagen Autoeuropa and Ultimaker. Using 3D printers from Ultimaker (www.ultimaker.com), Volkswagen could, through inhouse work, quickly employ tools, jigs and fixtures on its assembly line, cutting costs and lead time for more-complicated-to-manufacture metallic tools. The application can pay dividends for manufacturers looking to economically speed deployment of such products in their facilities. Philips Lighting and Materialise earned the Industrial Product Application Award for development and application of lamp-holding parts via 3D metal printing. Materialise (www.materialise.com) probed production-line operations to determine 3D-printing applications, leading to manufacture of the holder brackets. These hold lamps in place and keep lead-in wires away from heat as torches melt and seal off glass exhaust tubes. Repeated exposure to high temperatures on a continuous line, paired with a structure featuring welds across a four-piece bracket assembly, made breakage a common occurrence. Working with Philips, Materialise co-engineered and printed a new single-piece metal bracket, reducing time-consuming part assembly and eliminating weld-line bottlenecks. After months of use, the line has experienced no breakage issues. Machineworks accepted the Technology Innovation Software Award for its Polygonica solid-modeling software toolkit for processing polygon meshes. Available for providers of AM software and hardware, the toolkit enables complex geometrical operations such as mesh healing, 3D Booleans, solid offsetting, mesh modeling, quality-based remeshing and mesh analysis. At its show booth, Machineworks (www.machineworks.com) demonstrated the recently released Polygonica version 2.1, with additions including support for rapid lattice generation; sweeping of profiles and solids along paths; solid convexification; imprinting, embossing and engraving along curves and profiles; and mesh manipulation. Desktop Metal (www.desktopmetal.com) earned the TCT Rising Star Award for its efforts to make metal AM more accessible through its Studio system, a desktop printer that extrudes bound metallic rods to produce parts, eliminating many safety concerns while allowing users to build components inhouse in office environments. Walking the aisles at the TCT Show revealed a slew of innovative new products and services. We’ll include many in future issue of 3D Metal Printing, and following are a few that we spied. AM software developer Link3D (www.link3d.co) introduced Digital Factory, designed to support global collaboration projects, doing away with the traditional time-consuming and error-prone back-and-forth between partners. Now, all project partners can access the same work inside Digital Factory, updating and saving alterations as needed. Collaborating with Empire Cycles, a British bicycle design and manufacturing company, Renishaw (www.renishaw.com) helped create what reportedly is the world’s first 3D-printed bike frame. 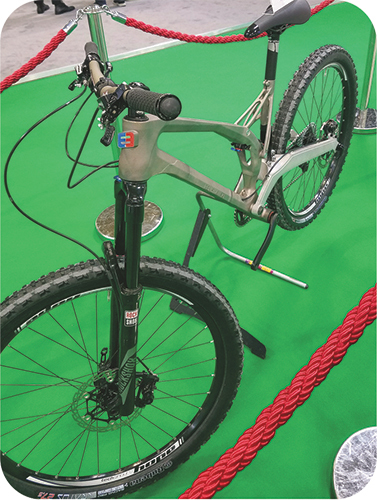 After optimizing the bicycle design for AM by eliminating many downward-facing surfaces that otherwise would require wasteful support structures, the team printed titanium-alloy parts on Renishaw’s AM 400. It then bonded the parts to form a frame weighing 33-percent less than its aluminum predecessor built using traditional processes. The AM 400 represents the latest offering on Renishaw’s AM 250 machine platform. Updates include a larger SafeChange filter, improved optical control software, revised gas-flow and window-protection features, and a new 400-W optical system that provides a reduced beam diameter of 70 µm. The AM 400 build volume measures 250 by 250 by 300 mm. Other features include open materials parameters, small factory footprint, reported class-leading inert atmosphere and low gas usage. The AM 400 also features an external powder hopper with valve interlocks that allow material addition while the process runs. It allows companies to intelligently automate, streamline and manage all additive processes and the supply chain, from R&D and metrology stages to the materials side, through to series production, according to Shane Fox, Link3D CEO. With part design established, partners can provide rapid-prototype report orders, and Digital Factory will route them to the correct facilities and machines via a scheduling tool. A pricing tool simulates the time needed to build a part, and then sends an invoice to the user's department, where part production can be scheduled with the push of a button. Production also easily can be outsourced to a variety of service bureaus that partner with Link3D. Other Digital Factory features include autonomous file-repair tools and a digital part inventory to ease reordering. Digital Metal (www.digitalmetal.tech), a subsidiary of metallic-powder provider Hoganas, announced commercial production of its DM P2500 printer, reportedly the industry’s first high-precision binder-jetting system, capable of producing small and intricate metallic components. The machine offers a print volume of 2500 cm3 and continuously prints in 42-µm layers at 100 cc/hr. without the need for support structures. It delivers 35-um resolution and an average surface roughness of Ra 6 µm. The process is adaptable for a variety of materials due to the sintering process that occurs after printing. And, powder removed before sintering can be reused, resulting in high yield and low scrap rates, according to company officials. “With the DM P2500 we are bringing to market a tried-and-tested 3D metal printer with the capability to produce objects with unparalleled accuracy and surface finish at high volume,” says Ralf Carlstrom, general manager of Digital Metal. The first machine has been sold to a fashion-design firm, with the second installed this past June at Centre Technique des Industries Mécaniques (CETIM), France’s benchmark institute and technological innovation hub for mechanical engineering. In addition, the company is moving forward with its new printing technology on several projects with manufacturers in a variety of industries. Also, as part of its production service, Digital Metal has produced approximately 200,000 metallic pieces in the last four years for industries including aerospace, luxury goods, dental tools and industrial-equipment manufacturing. Production of titanium propellant tanks via additive manufacturing, reducing costs by 55 percent, material waste by 75 percent and production time by 80 percent, earned Sciaky, Inc. and Lockheed Martin the 2017 Aerospace Application Award at the recently held TCT Show. Tech Soft 3D-provided modules instead of developing the technology inhouse. Software-development toolkits from Tech Soft 3D provide key capabilities such as CAD translation, visualization, modeling and mesh processing. Users include Sculpteo, nTopology, NetFabb and Xometry, that employ the Hoops software-development kits, and Renishaw, 3D Systems, Geometric and Simpleware, that use the Polygonica platform (Tech Soft 3D is the exclusive global reseller of the product). Stratasys uses both.